The past couple of years have been rough for our family. With job changes, an injured kid and several time-consuming volunteer positions added to the pressures of everyday life, it’s been a lot for our family. And then at the end of October, the baking element in our oven went out. My husband and I have been so busy, we haven’t had a chance to get it fixed. We just worked around it. Finally, the week before Thanksgiving, we ordered the part. Which meant that we would not have an oven to bake our turkey day delights. But rather than adding to the stress, it has caused me to reflect on how (relatively) easy it has been to live without the oven. And how very blessed I am. Most human beings have an almost infinite capacity for taking things for granted [Aldous Huxley, Themes and Variations (1954), 66]. When we encounter challenges and problems in our lives, it is often difficult for us to focus on our blessings. However, if we reach deep enough and look hard enough, we will be able to feel and recognize just how much we have been given. I need to live in thanksgiving daily, not just on turkey day. And it begins with remembering how many wonderful things I have in my life. The coming of electricity to their farm was almost the last good thing that happened to them that year. Sometimes it takes turning off the lights (or a burned-out oven element) for us to humble ourselves enough to see what we really have. Confidence in something or someone. As most often used in the scriptures, faith is confidence and trust in Jesus Christ that lead a person to obey Him. Faith must be centered in Jesus Christ in order for it to lead a person to salvation. Latter-day Saints also have faith in God the Father, the Holy Ghost, priesthood power, and other important aspects of the restored gospel. Faith in the Lord Jesus Christ is not something ethereal, floating loosely in the air. Faith does not fall upon us by chance or stay with us by birthright. It is, as the scriptures say, “substance …, the evidence of things not seen.” Faith emits a spiritual light, and that light is discernible. Faith in Jesus Christ is a gift from heaven that comes as we choose to believe and as we seek it and hold on to it. Your faith is either growing stronger or becoming weaker. Faith is a principle of power, important not only in this life but also in our progression beyond the veil. By the grace of Christ, we will one day be saved through faith on His name. The future of your faith is not by chance, but by choice. Faith is one of the things that helps me get through the tough times. Faith that everything will work out—and that, eventually, the tough times will end. The gospel is our Heavenly Father’s plan of happiness. 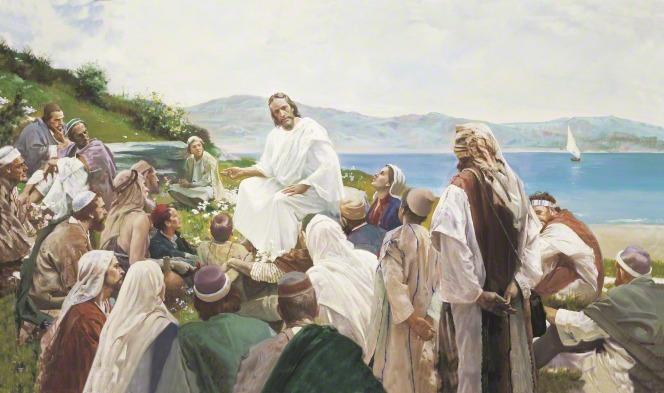 The central doctrine of the gospel is the Atonement of Jesus Christ. 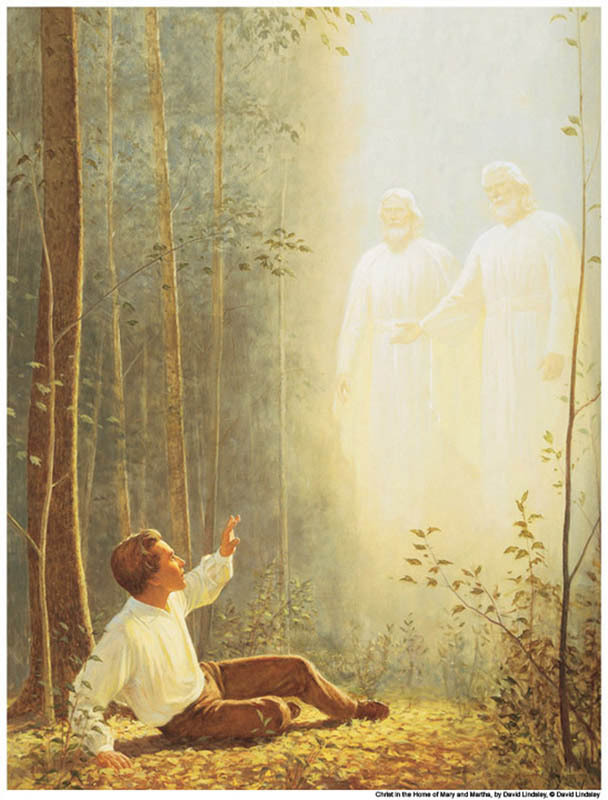 The Prophet Joseph Smith said, “The first principles and ordinances of the Gospel are: first, Faith in the Lord Jesus Christ; second, Repentance; third, Baptism by immersion for the remission of sins; fourth, Laying on of hands for the gift of the Holy Ghost” (Articles of Faith 1:4). In its fulness, the gospel includes all the doctrines, principles, laws, ordinances, and covenants necessary for us to be exalted in the celestial kingdom. The Savior has promised that if we endure to the end, faithfully living the gospel, He will hold us guiltless before the Father at the Final Judgment (see 3 Nephi 27:16). It is not enough for anyone just to go through the motions. The commandments, ordinances, and covenants of the gospel are not a list of deposits required to be made in some heavenly account. The gospel of Jesus Christ is a plan that shows us how to become what our Heavenly Father desires us to become. In following this plan and obeying the laws and partaking of the ordinances of the gospel, I find true happiness. Happiness that transcends the dark days and allows me to find joy no matter what is going on around me. There is no greater expression of love than the heroic Atonement performed by the Son of God. Were it not for the plan of our Heavenly Father, established before the world began, in a very real sense, all mankind—past, present, and future—would have been left without the hope of eternal progression. As a result of Adam’s transgression, mortals were separated from God (see Rom. 6:23) and would be forever unless a way was found to break the bands of death. This would not be easy, for it required the vicarious sacrifice of one who was sinless and who could therefore take upon Himself the sins of all mankind. Thankfully, Jesus Christ courageously fulfilled this sacrifice in ancient Jerusalem. There in the quiet isolation of the Garden of Gethsemane, He knelt among the gnarled olive trees, and in some incredible way that none of us can fully comprehend, the Savior took upon Himself the sins of the world. Even though His life was pure and free of sin, He paid the ultimate penalty for sin—yours, mine, and everyone who has ever lived. … Without the Atonement of the Lord, none of these blessings would be available to us, and we could not become worthy and prepared to return to dwell in the presence of God. Marriage, the family, and the home are the foundation of the Church. Nothing is more important to the Church and to civilization itself than the family! 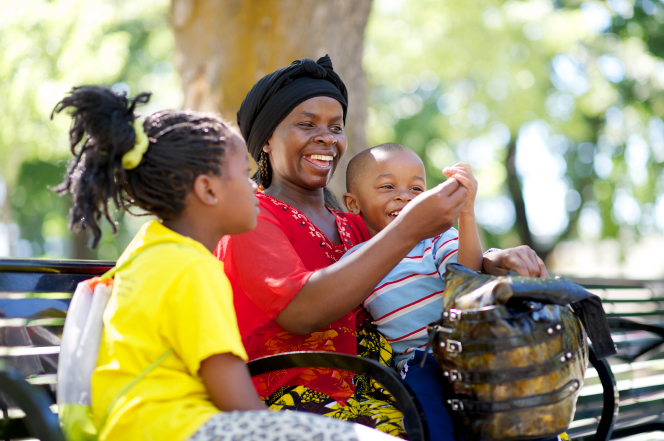 We build deep and loving family relationships by doing simple things together, like family dinner and family home evening and by just having fun together. In family relationships love is really spelled t-i-m-e, time. Taking time for each other is the key for harmony at home. We talk with, rather than about, each other. We learn from each other, and we appreciate our differences as well as our commonalities. We establish a divine bond with each other as we approach God together through family prayer, gospel study, and Sunday worship. I appreciate the time and effort that my parents put in to teach their eight children the importance of being friends as well as siblings. My mom told us—and now we tell our kids—that our friends would come and go but our brothers and sisters would be friends for life. And they are. My husband and his family share the same bonds of love and friendship because of their parents. I have never felt like an outsider in his family, and my family loved my husband from the first time they met—which was before he and I were even together. This is from the culture of love created by both my parents and his, and it lives on in the next generations. … No love in mortality comes closer to approximating the pure love of Jesus Christ than the selfless love a devoted mother has for her child. … It is not only that they bear us, but they continue bearing with us. It is not only the prenatal carrying but the lifelong carrying that makes mothering such a staggering feat. Of course, there are heartbreaking exceptions, but most mothers know intuitively, instinctively that this is a sacred trust of the highest order. The weight of that realization, especially on young maternal shoulders, can be very daunting. Do the best you can through these years, but whatever else you do, cherish that role that is so uniquely yours and for which heaven itself sends angels to watch over you and your little ones. I do cherish my little ones, who aren’t so little anymore. I wonder where the time has gone, but I am so grateful that I get to be here with them. In God’s kingdom, greatness and leadership means seeing others as they truly are—as God sees them—and then reaching out and ministering to them. It means rejoicing with those who are happy, weeping with those who grieve, lifting up those in distress, and loving our neighbor as Christ loves us. The Savior loves all of God’s children regardless of their socioeconomic circumstance, race, religion, language, political orientation, nationality, or any other grouping. And so should we! God’s greatest reward goes to those who serve without expectation of reward. It goes to those who serve without fanfare; those who quietly go about seeking ways to help others; those who minister to others simply because they love God and God’s children. 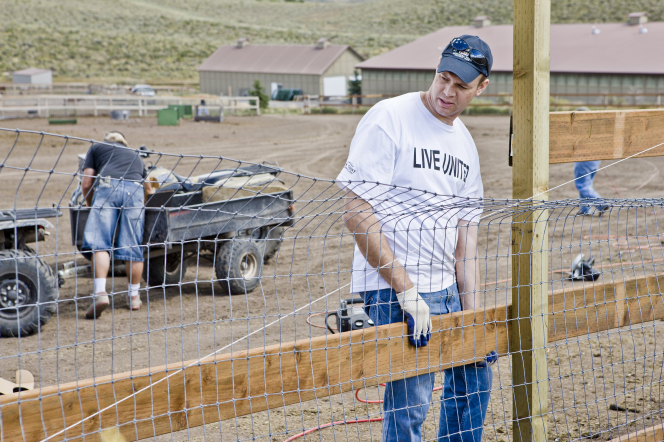 To me, it means helping out where there is a need—at school, at church or in the community. To me, serving others is a sign of gratitude for all that I have been given. It is easy to be grateful for things when life seems to be going our way. But what then of those times when what we wish for seems to be far out of reach? This type of gratitude transcends whatever is happening around us. 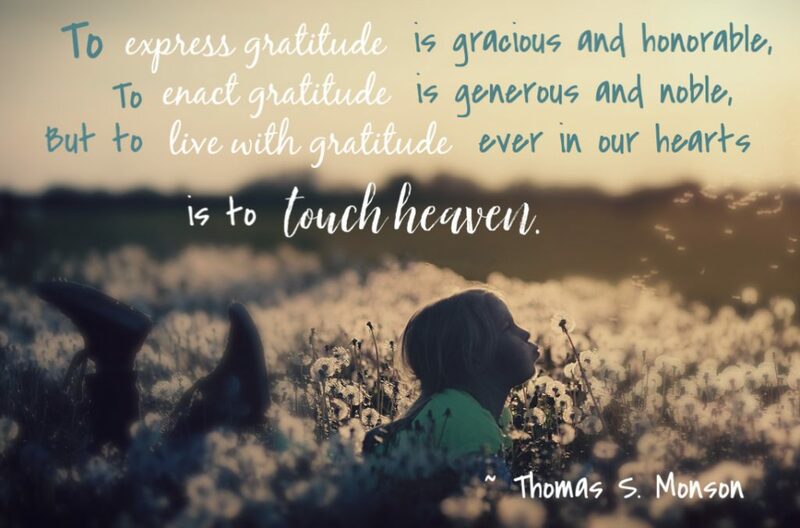 … To express gratitude is gracious and honorable, to enact gratitude is generous and noble, but to live with gratitude ever in our hearts is to touch heaven. Being grateful in times of distress does not mean that we are pleased with our circumstances. It does mean that through the eyes of faith we look beyond our present-day challenges. This is not a gratitude of the lips but of the soul. It is a gratitude that heals the heart and expands the mind. Having a spirit of gratitude won’t take away the frustrations or get my oven fixed any faster, but it helps me to see the past them. To the good times with my husband and kids. To the stove top, crock pots and roaster with which to cook. To the Savior and His teachings. 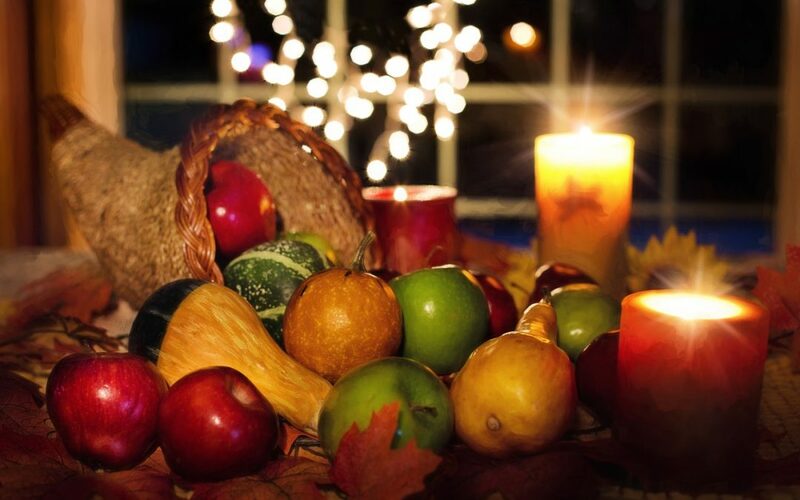 To all of the blessings I enjoy—and the gratitude that allows me to “live in thanksgiving daily” (Alma 34:38).